Taste test: This bar had the same shape as a normal Kit Kat, with the trademark four parallel sections, but it had a pale orange color. This was the first Kit Kat that I've tried that wasn't chocolate, but the label said Kit Kit, so I guess it was still a Kit Kat. It tasted like an orange creamsicle, with a very sugary orange creme taste. Perhaps it tasted a little like orange-flavored white chocolate. (The second ingredient was Cocoa Butter.) Not bad, but I usually reach for a candy bar when I have a chocolate craving, not when I have an orange craving. When that happens, I get some orange juice (or an orange). Smell test: Smells exactly like a Creamsicle. Mmmmm. 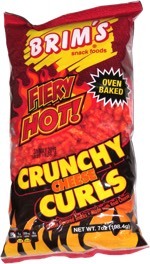 This snack was discovered by Jeremy at Store 24. Review published .